Derby City Ballroom offers dance lessons in over 20 styles of partner dancing. Originally "Ballroom Dancing" was a term used for any style of dance done in Ballrooms. We use the phrase "ballroom dancing" as a general term and refers to almost any type of partner dancing. 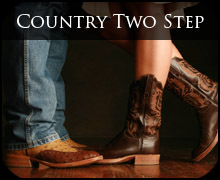 While we teach all forms of partner dance, we specialize in the most popular social dances of today. 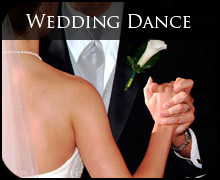 Below you will find a description of the traditional ballroom and Latin dances that we offer. FOXTROT - The Foxtrot is a smooth, progressive dance characterized by long, continuous flowing movements across the dance floor. It is danced to big band (usually vocal) music. Developed in the 1910s, the foxtrot reached its height of popularity in the 1930s, and remains practiced today. WALTZ - Quite possibly the most popular ballroom dance in the world. Waltz is danced to 3/4 time and can be danced to music found in nearly all genres. TANGO - Tango originated in Argentina and was adapted for ballroom dancing. It is characterized by its provocative figures, catlike walking action, and staccato (sharp) head movements. VIENNESE WALTZ - This dance was born in the suburbs of Vienna and in the Alpine region of Austria in the 1700s. Like the slow waltz, it uses 3/4 time music but the tempo is much faster. 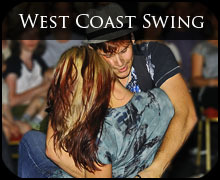 SWING - An upbeat, lively, "lilted" dance. Swing is fun and easy to dance and is one of the most useful in social situations. MAMBO - Spicy and fun! Very similar to Salsa in pattern, but Mambo is always danced "on 2" and is a bit more linear in movement. BOLERO - A slow Latin dance which originated as one of two forms of Rumba. It still shares many of the same figures, yet differs in its tempo and movement. QUICKSTEP - Much like a fast version of the Foxtrot, the Quickstep is a ballroom dance style composed of extremely quick stepping and syncopated foot rhythms. PASO DOBLE - Paso Doble is a lively dance modeled after the drama of the Spanish bullfight. In Spanish, Paso Doble translates as "Double Step"
SAMBA - A fun, rhythmical Brazilian dance which has been adapted for modern Ballroom Dancing. Samba is characterized by both Latin hip motion and its signature "Samba Bounce". JIVE - Essentially a European version of east coast swing dancing, although Jive is danced to slightly faster music and has a higher "bounce" through the knees. 2 - 30 Minute Private Lessons only $10 each! For a limited time, we are offering all new students 2 private dance lessons with one of our professional instructors for only $10 each! 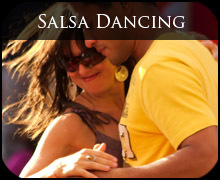 We will introduce our dances and discuss your goals! Singles or couples welcome. We have literally taught thousands of beginner dancers just like you to become confident social dancers. Find out what dance can do for YOU! Copyright 2015. Derby City Ballroom Dance Studios Louisville ballroom dance lessons Louisville KY in all styles of ballroom dancing in Louisville ballroom dance lessons in Louisville KY.